Our alpacas are fully guaranteed, AOA registered huacaya alpacas that are personally raised and managed by us resulting in lower ranch overhead with the savings passed on to you, the buyer. We will be happy to discuss with you the fine selection of alpacas we have for sale. If you specifically know what you are looking for, we will do our best to accommodate your individual needs. For those who don't have specifics in mind, we invite you to visit us at the Grand Alpaca Company where you can see firsthand the beauty of these regal animals and observe their gentle nature and calm dispositions. At that time, we can answer any questions you might have about the attractive lifestyle and investment opportunities that await you with alpaca ownership. Why buy your alpacas from us? We have more than 100 alpacas to choose from, learn more about what we have to offer at our Michigan alpaca farm. 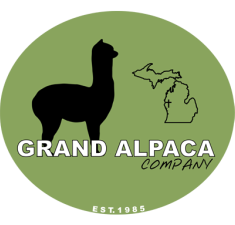 Read about the guarantees and services that we offer along with the sale of our Michigan alpacas.